What can you do on Millenium State platform? Millenium State is the first numismatic online auctions platform. Millenium State brings together general public and collectors worldwide. 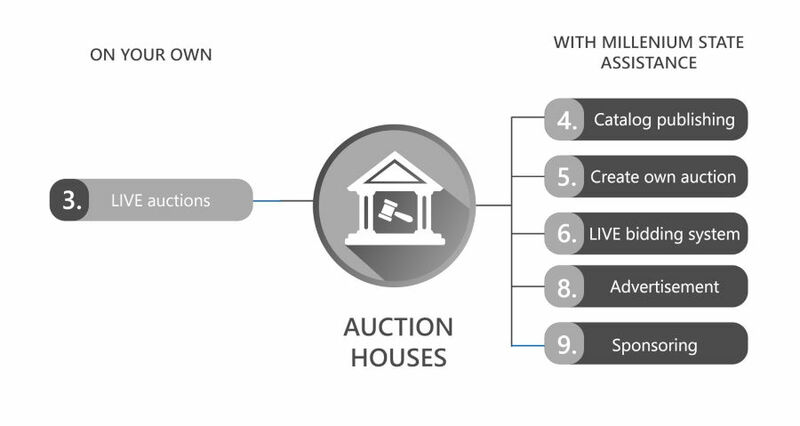 Buy and sell your items "in auctions"
As a seller, you have the opportunity to auction your currencies on Millenium State. As a buyer, you can bid on the several offers that buyers uploaded, in order to obtain the item you are looking for ! 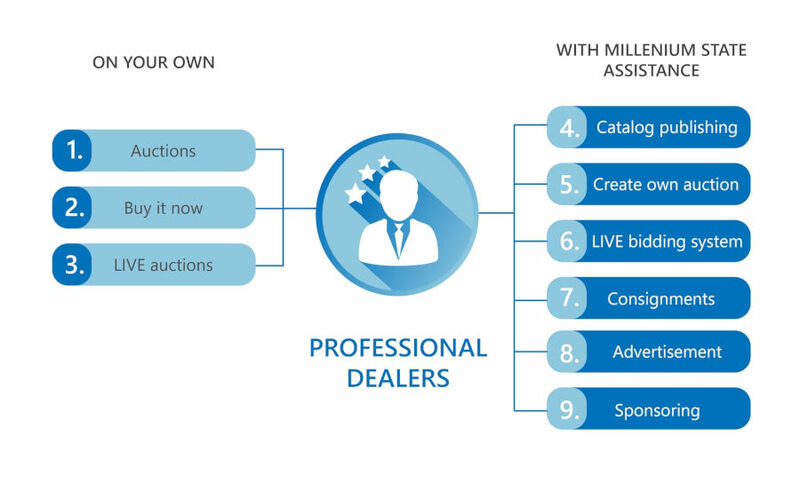 As a seller, you can create your e-shop on Millenium State platform. You can sell your item with fixed prices or you can accept a best offer. "Pre-auctions" are held 15 days before the auction in which each verified member can already place a bid. The d-day, by the end of the auction, the person who placed the highest bid will bring home the item. Already organizing auctions? Millenium State helps you become more visible by sharing your catalog to all of ours numismatic enthusiasts who are subscribed on the platform. We will redirect the links of your currency directly on your website. Are you a dealer and wish to sell your rare items in auctions? It is now possible on Millenium State! Select an available day in our calendar, we will assist you throughout the whole process and will make your auction. During the auction, you will be able to manage everything via your dashboard. Formations can be given in order for you to understand and use the system. Already organizing auctions? Come and give it a try to our "Live Bidding System" last generation to maximize your sales results! Free and easy to set up, you will be able to reach our customer service during the whole process in case of need. We offer you the possibility to put on sale your rarest currency and collections under our name in our diverse live auctions. We will take care of the whole process, from the appraisal up until the listing for auctions by way of taking photos or any other step you would deem necessary. The purpose being spare you time and effort. Our filing offices are located in Luxembourg (LU) and Vilnius (LT). Everyday Millions of numismatic enthusiasts are looking for new currency to add to their collection. For that very purpose, they surf on Millenium State. To confide in us to promote your various events will potentially reach all of these buyers all over the world and make them have a look at it. Write us via our "Contact" tab to obtain more information. Becoming a sponsor is to integrate our brand image. It is about sharing this passion for numismatic and travelling with us to our events while incorporating our values and our know-how. 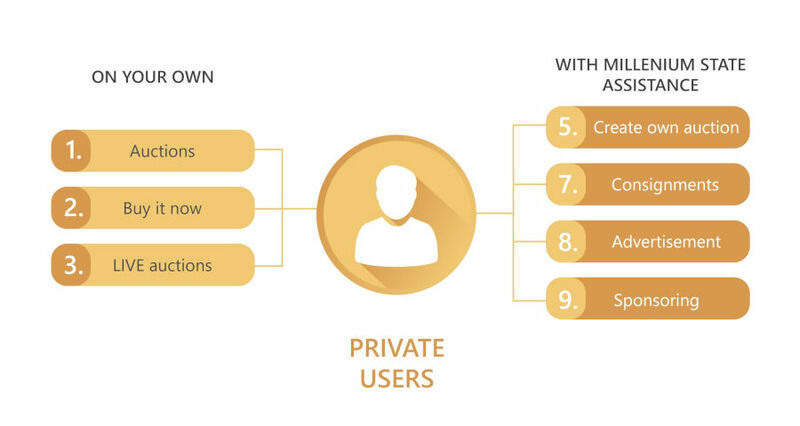 Who and how can use Millenium State platform?